Andrew Harris has been guiding in northern California since 1997. He lives in Red Bluff, California with his wife Katie and daughters Mackenzie and Madison. In 2007 Andrew created Confluence Outfitters with help from partners Gino Bernero and Jon Hazlett. Andrew puts the "Outfitter" in Confluence Outfitters, as he is the one who answers the phones and emails. Andrew really enjoys helping our guests plan their trips. Confluence Outfitters has a great group of guides and a bewildering array of venues in northern California, southern Oregon, and Washington. Andrew can help you select the right guide, destination, and time of year for your next fly fishing trip. Andrew is a USCG-licensed Captain which means he can operate a motorized boat in the inland waters of California. 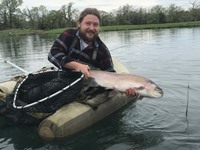 He puts this license to good use on the lower reaches of the Sacramento River where he uses his jet boat to fish for striped bass, trout, and steelhead. Andrew has been a pioneer of using lightweight spey rods for trout on the Lower Sac. Andrew's jet-boat Trout-Spey trips are very popular. 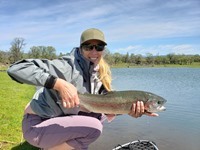 Since 2010, Andrew and his wife Katie have been the exclusive booking agent for Eagle Canyon, a private trophy-trout destination near Red Bluff. Eagle Canyon is open from December through mid-April and is a great place to fish for rainbow trout from 3 to 15 pounds. 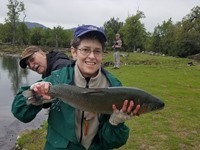 Andrew is a regular on the northern California fly fishing club circuit and typically does 5-10 presentations a year. Andrew has a wide variety of presentation topics to choose from. He also writes regularly for California Fly Fisher magazine and is the author of the Plumas National Forest Fishing Guide, a fly fishing guidebook to the Feather River Country. Andrew also has a career as a software developer. He created LodgeRunner.com, a booking system designed for fishing and hunting lodges and outfitters. LodgeRunner helps Confluence Outfitters and other high-profile fly fishing businesses like Henry's Fork Anglers, Silver Creek Outfitters, and Pere Marquette Lodge manage their bookings and assign their guide trips. Andrew loves working with other outfitters and lodges and has helped dozens of them optimize their booking systems by using LodgeRunner. Andrew also creates software for hay exporters and many other agribusiness clients. Andrew has guided for 20 years and now spends most of his time booking trips and trying to keep the rest of the guide staff busy. "Great day with you and Pete. Fishing was terrific and you were fantastic, very patient and kind as we were late with our strikes or long with our casts and short with our mends. I look forward to fishing with you again soon." "Jeremy and I had probably the best fishing day of our lives on Saturday 11-17-2015. Thanks for all your persistence in navigating to the right place where all the fish were." "Thank you again for a first class experience fishing with you on the Lower Sacramento River. Your professionalism speaks for itself. My son and I look foreword to our next trip fishing with Confluence Outfitters. OUTSTANDING!"